Who is your role model today? Who do you look up to?? Who do you follow and try to emulate??? We humans have been created as social beings and that's where we thrive and survive. We look up to others who inspire us and are doing great things and we want to be like them. It could be anyone from our pious predecessors - all the way to movie stars, musicians and celebrities. When it comes to the celebrities we know everything about them and can go on forever. But what about our pious predecessors? How much do we know about them and how far are we willing to travel to learn and then emulate them? Listen, none of us will be like our pious predecessors or even the celebrities we follow. You and I are uniquely created and each of us has that something special to offer the world. And just as we look up to celebrity females for life tips and hints (sometimes real bad examples!) we need to look into our pious predecessors. Ready to take a journey into the past and get lessons from a great woman in Islam who has a whole surah in the Qur'an named after her, was the mother of a Prophet AND has valuable lessons to teach us today? Introducing Maryam (as) - the Virgin Mary - the Mother of Prophet Jesus (pbuh) and MY role model! Although there are not many books written on her (I have one i will recommend in the class) I attended an online 9 week tafsir class about 2 years ago and after re-visiting the tafsir I picked up so many personal development lessons from just the first 30+ verses. My jaw dropped - how did I not see this before? Well, maybe because right now is the right time and right now is when it was written and decided from above that I should teach you all this Masterclass. 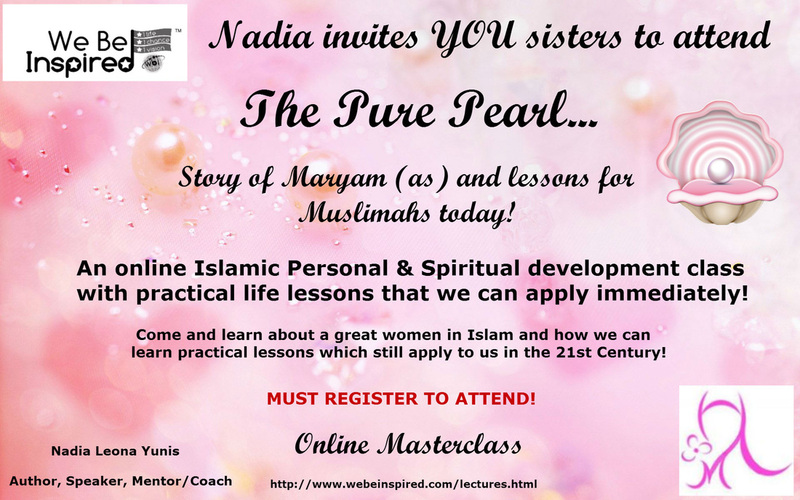 This is an online 90 minute (max) Masterclass where we will go through the story of Maryam (as) and then take out the personal development gems and dissect them to see how we can apply them to our life today. There are lessons in God-Consciousness, awareness, trust, keeping secrets, hope, guarding one's soul, pain-relief and so much more! Exactly - a lot to cover. We will not cover the verse by verse translation (as I said above I attended 9 online lessons that covered a lot!) however that will be available for anyone offline to book. This class costs £15 to attend. You will get the replay link (so no worries if you can't attend live, BUT you MUST register and purchase a ticket) as well as a pdf handout with all the personal development gems. I'm really excited about teaching this class - so say bismillah, pop your email address below and then follow the instructions to purchase your ticket insha'Allah. (Once you you click submit below it will ask you to check your email inbox for confirmation link - please also check your junk/spam box just in case - when you find that email, click on confirm and then wait as the page will take you direct to tickets page). By now most of you sisters will know who I am - however I appreciate that many of you will be knew to me and my work so please kindly click on the 'About' section to read my full bio and then connect with me over on my public pages on facebook. Register below and i'll see YOU in class!!! Register me for this Masterclass! You will also receive our *FREE* complimentary newsletter.